The weekend had arrived but it looks like it's going to be another wet one, so what have you got planned ? I hope to do some shopping and hopefully some crafting as I have a lot of projects to do for upcoming events during February. 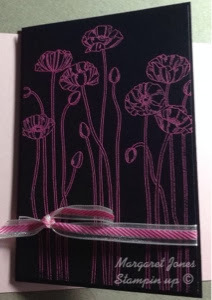 Next Saturday we have the Valley Park craft class where I will be demonstrating a flip album. There are still spaces available, please get in touch in you would like to join us. On 22 February I will be demonstrating the Big Shot at Hobbycraft where I am an Artisan designer. 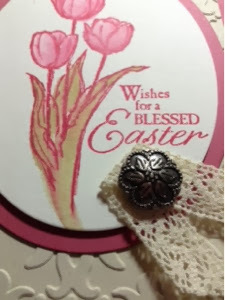 This time I will be making Easter projects so thought I would make a start. I used the blender pens to produce a watercolor effect. I really enjoyed making these and they are quite different from my usual style. I hope they inspire you to create something different. I hope that you are all well and looking forward to the weekend. If we all wish hard together do you think we could get a nice spring day , let's try we need it. A fairly simple card but I am sure it would go down well. A home made valentine really shows you care. I am busy preparing a project for a class in Hampshire on 8 February . 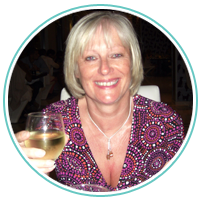 If you would like further details please check out the details on the classes page. 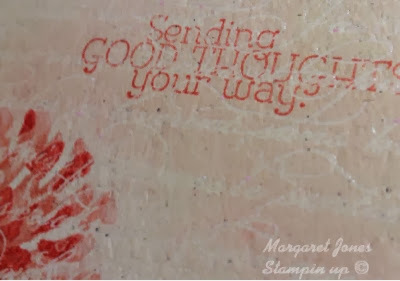 If you don't own a Big Shot but love embossing then this new tool introduced by Stampin up will be just the thing for you. The Texture Boutique Embossing Machine works with Textured Impressions Embossing Folders to transform ordinary cardstock, paper, metallic foil, or vellum into an embossed, textured masterpiece. This machine embosses only; it does not die cut. Comes with 1 pair of Standard Embossing Pads and 1 Mylar Shim. Today sees the start of Sale-a-bration and the launch of the new Spring catalogue. 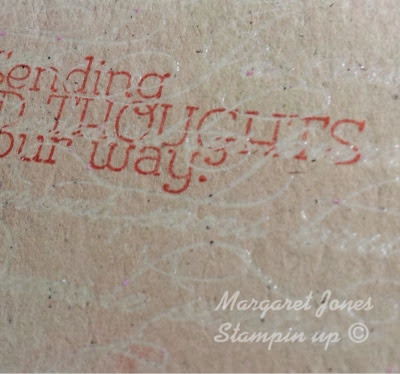 This is a really exciting time for Stampin up. It is a chance to get free products and we all like to get something for nothing don't we ? I hope you are all enjoying the better weather that we are currently being treated to. I have completed another card challenge today, two this week already and it's only Tuesday ! 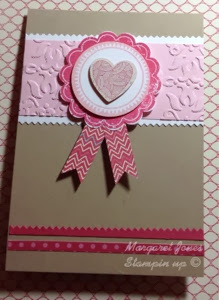 This one is an entry for the Dynamic Duos Challenge (http://thedynamicduoschallenge.blogspot.co.uk) where they choose two colours and you have to submit a card using only those two colours. This weeks colours are Pool Party and Pink Pirouette. We have had a lovely sunny day on the South coast. I have been busy making projects for my upcoming classes but thought I would take some time out to design a card for the LIM challenge. I used to take part in card challenges on a regular basis but seemed to get out of the routine of doing them. So hopefully this will be the start of engaging in them again. 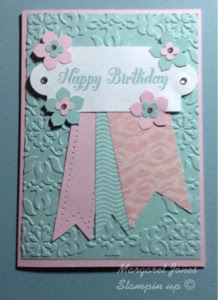 I am also entering this card for the CAS challenge where the theme is something new. It is quite difficult to see the layering of the aperture in these photos but the dark blue oval ring is stuck to the top of the card and the image and the light blue ring are attached to the inside of the card. I have just had a chance to experiment with some of the lovely products which arrived at the end of last week. There are some fantastic new products in both the sale-a-bration and the new spring catalogues which are both being launched on 28 January. 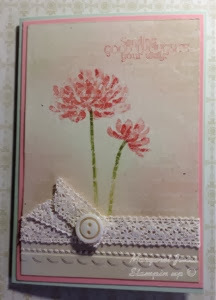 I hope that some of my cards inspire you to have a go and make some of your own cards. I really enjoy it and find it very relaxing. As promised , today I am sharing with you the projects that the ladies made at our craft class on Saturday. 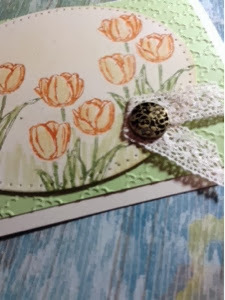 After our lunch of soup, savoury snacks and cake I demonstrated 3 projects using the Chalk Talk and Gorgeous Grunge stampsets. The ladies also had another try with the envelope punch board which they all enjoyed. They filled these with cappachino sachets and there was room to add other sachets of coffee, hot chocolate and other goodies. One of the ladies pointed out that they would make good wedding favours of which she may have a batch to make for the summer. 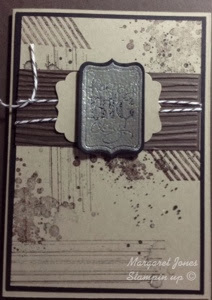 This was in a vintage style and again used both of the stampsets, Gorgeous Grunge for the background and Chalk Talk for the label. 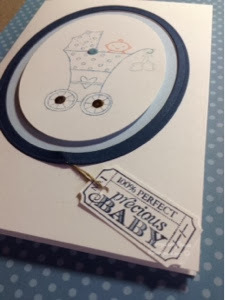 And just to prove that the stampsets are very versatile we also made a masculine card using the same stampsets. 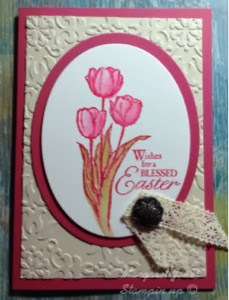 All three projects also used heat embossing which the ladies really enjoy. The magic of watching the embossing powder turn solid and shiny with the heat gun never fails to impress . We had a great time with a lovely group of ladies at our craft class on a Valley Park yesterday. 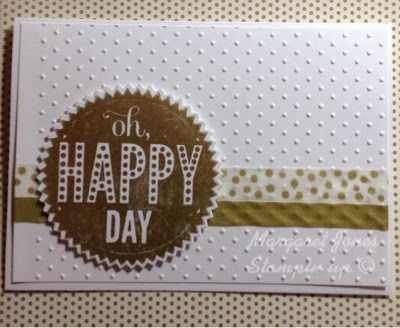 Aly and I had both designed projects using the envelope punch board from a Stampin up. 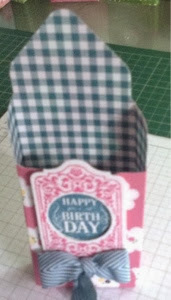 In the morning Aly showed the ladies how to make a box with the punch board and teamed it up with a gatefold card. 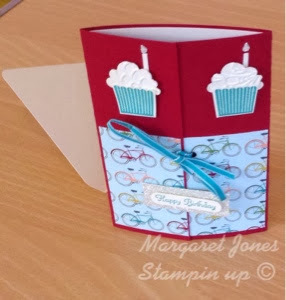 The card used the cupcake builder punch . All the ladies made some lovely creations. This was followed by soup , snacks and of course some cake. 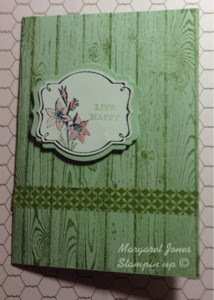 During the afternoon I demonstrated a treat holder and two cards using the Chalk Talk and Gorgeous Grunge stampsets. Please come back tomorrow when I will show you photos of the projects we made in the afternoon. 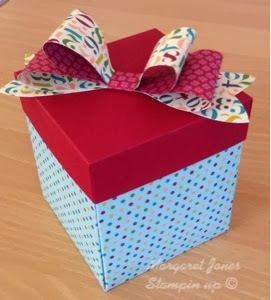 I have been really busy making projects for our craft class on Saturday and I have also made several examples for the display table, so I have neglected updating my blog for a few days. 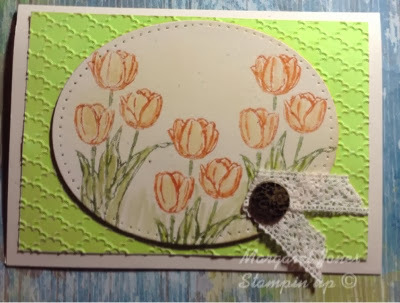 One of my current favourite stampsets is Too Kind which is a two part stampset , so I have been experimenting with it. 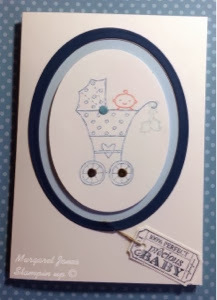 First of all I used Versamark to stamp the background stamp En Francais which I embossed with clear embossing powder. I then sponged Pistachio Pudding and Crisp Cantaloupe on top so that the embossed image started to appear. The stampset a Too Kind was stamped in Old Olive, Crisp Cantaloupe and Calypso Coral. 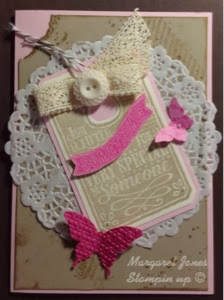 I then used the crocheted ribbon in vanilla and embossed a border underneath. Close up the clear embossing looks very effective. 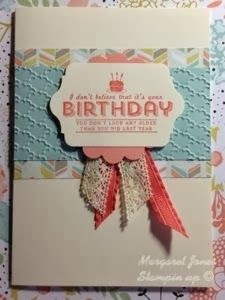 I really enjoyed making this card and hope that it has inspired you.